Let’s visit cute little turtles and relax at the beach at the same time! Take a look at this great Sunweb deal to crystal clear beaches in Turkey! 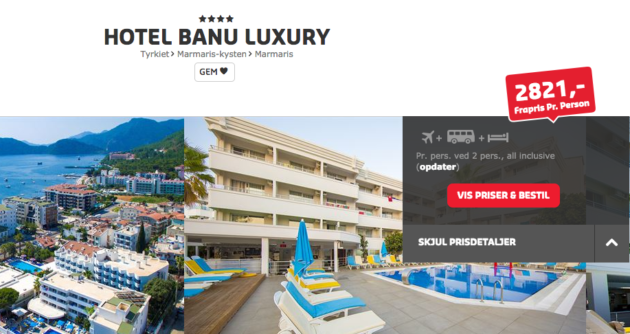 From only 2821 kr you can take a trip for 7 days to Marmaris, Turkey, with all-inclusive board, hotel, transfer and flights included. Enjoy 7 nights of all-inclusive at the 4* Banu Hotel Luxury. 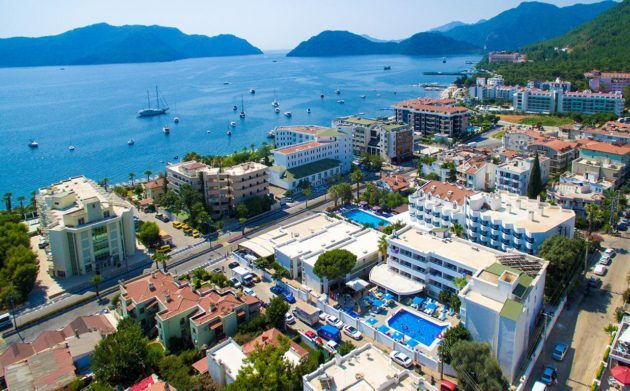 The hotel is located in the beautiful city on the sea Marmaris on the south coast of Turkey, just 50 m from the beach. ? The hotel has an outdoor pool, air conditioning and provides a great live show in the evening. Free WIFI is available throughout the entire facility and you can play ping-pong and billiard. The all-inclusive board provides you tasty buffet breakfast, lunch, dinner, snacks and delicious cocktails at the bar. ? The 4* hotel has received great reviews on Tripadvisor and has been awarded with a 4 out of 5 rating from 310 different reviews. When in Marmaris you have to visit the Iztuzu beach near to the city Dalyan and observe the turtles at the coast. Let’s go to the Turkey deal! Sign up for our Newsletter, and don’t miss anymore deals. You’ll be the first to find out about our Turkey bargains!